Matching the HBO version of Ice, from the Game of Thrones TV series, this heirloom has been passed down from generations of Starks for centuries. 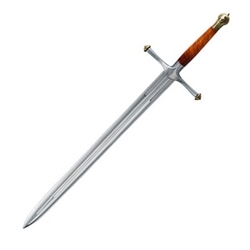 This quality letter opener is a faithful recreation of the on-screen version, and features the brown handle with antique brass handle and accents. Fans of the Game of Thrones series on HBO will enjoy opening their letters with Ned Stark‘s Ice!